ANY BARCODE . A NEW LEVEL OF PERFORMANCE . MORE VERSATILITY. If you're looking for extraordinary flexibility and performance in your handheld scanner, the next-generation scanning technology in the DS4308 delivers. Its truly extraordinary range does the job of two scanners, allowing you to scan nearer and farther than any other scanner in this class. Your workers can scan virtually any bar code. The DS4308 does it all - 1D or 2D, electronic or printed on paper labels or plastic cards, even if the bar code is dirty, scratched or poorly printed. 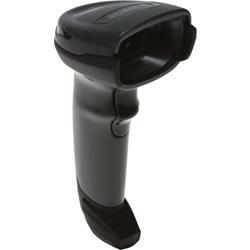 With PRZM Intelligent Imaging inside, your workers can capture bar codes as fast as they can pull the scan trigger. And that means no more Point-of-Sale exceptions that can turn into longer lines, longer wait times and lost sales. The DS4308 - a new class of scanner for a new world of bar codes.